Want your next corporate conference to stick with your attendees? The corporate event planning experience needs to evolve with emerging trends that not only optimize the attendee experience but also optimize the corporate event planning performance. Following flashy fads never amounts to much, but sifting through a pile of innovations that work best for your meeting or conference can maximize these two factors. Here are some of the best trends to use at your next event in 2017. Not that long ago, event data was a mess of information that took a lot of manpower to sift through. As cloud-based databases have grown more powerful, important analytics gleaned from the data can make a big impact at your big event. The best-selling author on the topic of big data, Bernard Marr, states, “Within five years there will be over 50 billion smart connected devices in the world, all developed to collect, analyze and share data.” Why not use this to your advantage? We use event apps to promote event networking and help communicate critical messaging for the big conference. However, aside from organizing and connecting, another beautiful benefit to these apps is its tracking technology. Tracking technology measures what interests potential attendees about your event through every touch within the app. Big data can help an organization tell the story of its potential attendees. The creative minds of any marketing team are irreplaceable, but utilizing analytics can compel even the best internal marketing campaign even further. Personalizing digital and traditional outlets through data help drive audience growth at any event. Two Sides Study reported that 69% of consumers prefer to read print over email. That statistic is just as relevant for internal communication – just think of all the emails in your inbox right now. Don’t abandon internal email marketing altogether, but refine it in order to be more conversational. Therefore, creating digital and traditional collateral that speaks individually rather than to a whole makes the largest impact. It will not only drive audience sizes but spark positive internal engagement. Your brand’s public personality and internal culture are heavily dependent on one another. People spend three times longer watching live video on Facebook compared to pre-recorded video. Connect with potential attendees who couldn’t make the event, or share experiences with the public to highlight your brand’s internal culture through Facebook Live or 360-degree videos. Introducing virtual reality to a massive event audience unveils the impossible on the event floor. Your people can be virtually teleported to a new space to convey new product offerings or the impact of existing services. TOMs Shoes used VR to their advantage to highlight the power of their service by transporting users to Peru during one of their giving trips. The more you use virtual reality to increase transparency and showcase your brand’s unique and useful mission, the more engagement you will receive. We’ve talked about how chatbots help save time, money and personnel. There are so many social platforms that already utilize chatbots for its users. Investing in chat technology for your event app will provide a convenient platform for attendees to ask FAQ’s regarding the event. These questions will even provide meaningful feedback for planners as they learn more about what questions their attendees are asking. Staying up to date on current trends will provide insight on how to deliver messaging and spread it in effective ways that will leave a lasting impression amongst event participants. 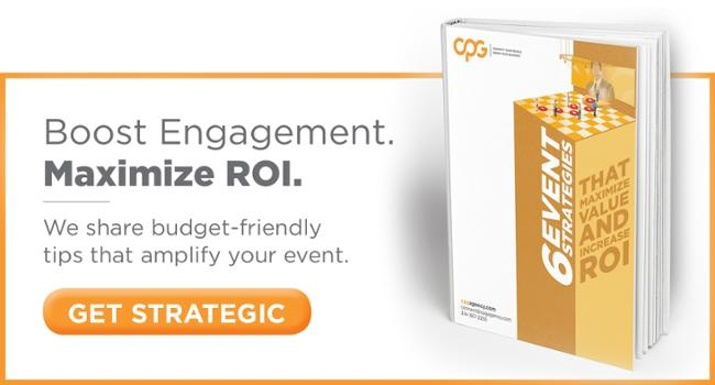 CPG offers a strategic approach to internal engagement and creative event strategies to elevate your brand’s message from a moment to a movement.